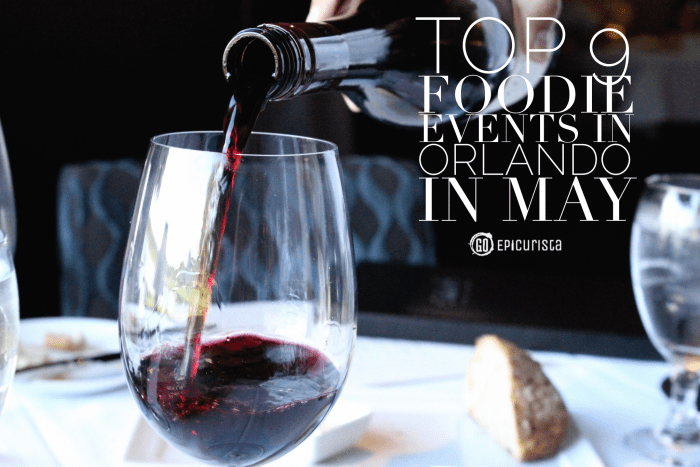 If you love food and fine libations, and you find yourself in Orlando, Florida – either living here or visiting – during the month of May, then these events are a must on your social calendar. Whether you love wine, whiskey or beer, take your pick, get your friends together and GO have a great time. I only share experiences worth celebrating and these events will give you plenty of reason to do so. Events listed are in date order as they could all top the list! Orlando Science Center hosts the 5th Annual Science of Wine on Saturday May 9, 7pm, a unique wine and food tasting with an educational twist. This is certainly a way to love science! Taste over 150 fine wines paired with food tastings from local restaurants and caterers, including Hawkers Asian Street Fare, Taverna Opa, Tap Toro Tapas Bar, Maxine’s on Shine, Dragonfly Robata Grill, John and Shirley’s Catering and many more. Learn from winemakers and educators about wine growing around the world, enjoy live performances by an aerialist and pianist, create a canvas painting, learn cigar rolling, and don’t miss presentations by Tim’s Wine Market and WFTV Meteorologist on Weather and Wine. $85/pp. Advance ticket purchase required. 777 E. Princeton St, Orlando. 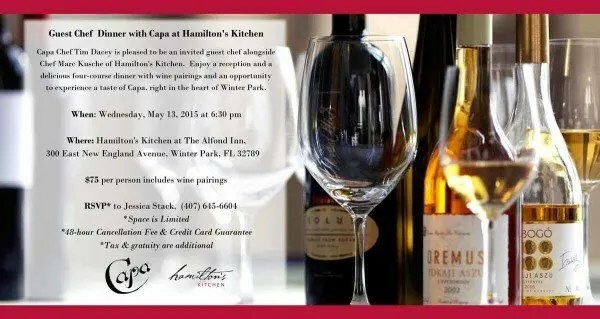 Hamilton’s Kitchen at The Alfond Inn hosts a unique al fresco dining experience on Wednesday May 13, as Chef Marc Kusche joins forces with guest Chef Tim Dacey of The Four Seasons Capa Steakhouse for a poolside springtime celebration of Florida’s freshest flavors. Four course dinner with wine pairing $75/pp. Reservations required by calling 407-645-6604. 300 E. New England Avenue, Winter Park. ^ During American Craft Beer Week, local micro-brewery, Orlando Brewing, is hosting a variety of events and special tastings, including a Beer and Chocolate Pairing. Yes, you read that right! (Who knew chocolate pairs with beer!?) on Wednesday May 13, 3pm-10pm, pairing four organic beers with four handcrafted chocolates from Emma’s Sweets. Pairings are $15, available throughout the day and reservations are encouraged due to limited availability. On Friday May 15, 6pm-8pm, Orlando Brewing hosts in conjunction with The Bias Palate, a five course Beer Dinner with craft beers paired with dishes using locally sourced ingredients. $50/pp reservations required. 1301 Atlanta Avenue, Orlando. 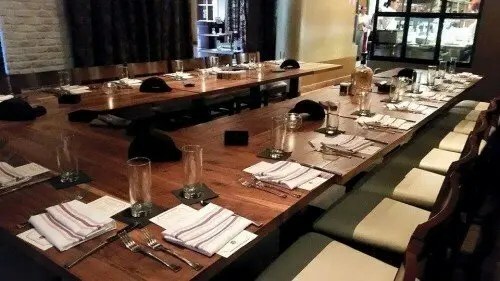 ^ On Wednesday May 20, Executive Chef Greg Richie hosts a five course Beer Pairing Dinner at SoCo Restaurant in Thornton Park, winner of Best New Restaurant in 2015, featuring Goose Island craft beers paired with his southern cuisine as a beer expert will guide you through the evening with a bit of history and education. Reservations required by calling 407-849-1800. 629 E. Central Blvd, Orlando. ^ Whiskey is the hottest spirit around right now! On Friday May 15, 7pm – 10pm, it’s all Whiskey Business at Orlando Weekly’s event exploration of wheat and rye. Sample your way across continents and discover the best scotches, bourbons and whiskeys and meet brand ambassadors, enjoy food and music, all in dapper “Mad Men” attire (recommended). $35 in advance tickets, $65 VIP tickets. Cheyenne Saloon, 126 W. Church Street, Orlando. ^ Some of the finest chefs in town come together for a spectacular event to raise funds for a great cause at The Heart of Florida United Way’s 23rd Annual Chef’s Gala on Saturday May 16 at Disney’s Epcot World Showcase. Enjoy mouth-watering dishes paired with wines from more than 20 Central Florida top chefs including K Restaurant, California Grill, 4 Rivers, Emeril’s Tchoup Chop, Primo by Melissa Kelly, Raglan Road Irish Pub, Everglades Restaurant and many more, plus live music and silent auction during this special evening. $275/pp advance tickets required. 200 Epcot Center Dr, Lake Buena Vista. 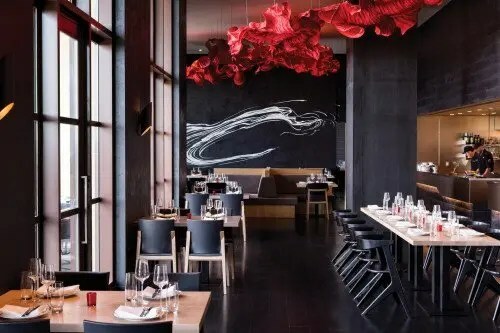 ^ On Monday May 18, Capa Restaurant at The Four Seasons welcomes 2015 James Beard Award nominee, Master Sommelier Rajat Parr for a five course dining experience expertly prepared by Chef Tim Dacey. This exclusive event at the 17th floor rooftop restaurant of this luxurious resort is not to be missed. $195/pp, reservations required by calling 407-313-7777. 10100 Dream Tree Blvd, Orlando. ^ Everglades Restaurant at Rosen Centre Hotel hosts their Vine & Dine Champagne Wishes & Mycologist Dreams Dinner on Friday May 22. If you love bubbles and consider yourself a mycologist (lover of mushrooms) then don’t miss this five course dinner hosted by the talented Chef Fred Vlachos. $75/pp, Reservations required by calling 407-996-8551. 9840 International Drive, Orlando. * You can read all about my Vine & Dine experience traveling through food in this post. ^ Christner’s Summer Wine Dinner Series on Friday May 29. Steak and wine enthusiasts join The Christner family and Tom Carrol of Foley Family Wines for an award-winning three course dinner featuring pairings with Kuleto Estates wines. $125/pp, Reservations required by calling 407-645-4443. 729 Lee Road, Orlando. 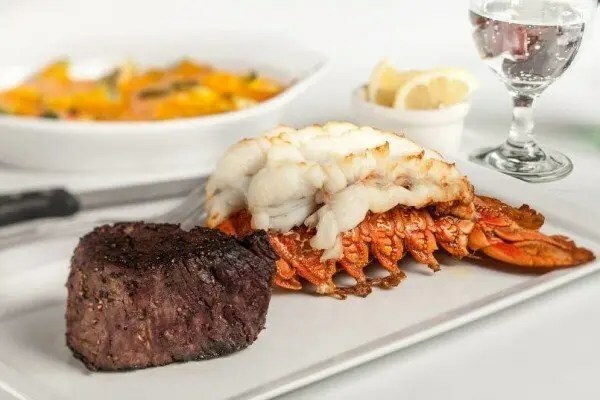 * Here’s a taste of the amazing feast you can expect at Christner’s Prime Steak and Lobster. ^ Wine Quest returns for its 19th year with Grand Tasting and Auction Event on Friday May 29 at 7pm, at Loews Royal Pacific Resort. Celebrating wines from around the world with tastings of over 200 wines, exquisite food, entertainment and silent auction to benefit Quest Inc. $85/pp advance ticket required. 6300 Hollywood Way, Orlando. 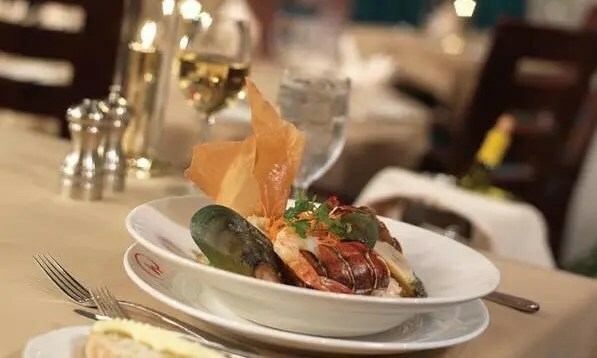 ^ Wine Quest Premier Dining Experience offers a five course dinner paired with fine wines on Saturday May 30, 6pm at Loews Royal Pacific Resort. $195/pp advance ticket required. 6300 Hollywood Way, Orlando. Which Food and Wine event will you choose to celebrate with friends? There are always so many foodie events in Orlando, so for any last-minute ideas and updates follow us on Facebook and Twitter. Wherever you GO, make it delicious fun with friends. * All photos are credited to their respective sources.